Part of the success of modern application is targeting it globally – all over the world. It isn’t possible to run such application on a single machine, even with most powerful hardware. Definitions like Distributed computing or Reactive applications were born in the process of IT globalization. Nowadays, applications run on multiple virtual machines distributed over multiple physical machines which are often spread around the world. Such applications aren’t easy to maintain. Every service has different hardware requirements and dependencies, so it has to be deployed and upgraded continuously. In addition each machine has to be configured in such a way that allows communication within the cluster and with external services. Although Devops have helpful deployment tools like Chef, Puppet or Ansible, these tasks still aren’t easy, trust me. Reactive Manifesto, published a few years ago, is a paper that defines the design guidelines of modern applications which help to deal with requirements of today’s businesses. It claims that an application should be Responsive, Resilient, Elastic and Message Driven. In short: an application should keep minimal shared state, expect crashes and recover from them quickly. It should also be easy to deploy and scale. Lightbend’s ConductR fills perfectly the Elastic part of the manifesto – it makes setup & deployment easier, while giving you enough flexibility to react on changing load. With the rise of microservice architecture it’s easier to write reactive applications than ever before. But this power also comes with a price. Loosely-coupled services are great when it comes to scaling production, but they also put burden on the local development. They add overhead when running, make correct setup difficult, turn local testing into ‘button mashing’ and programmers are bogged down when crossing the service boundaries (“What service should run on port X?”, “I think there’s something broken in my setup. How do I debug service Y?”…). Of course, the increased number of moving parts also hits the architects and people working in operations. To tackle this new landscape we need to toss away old tools, which don’t work in these new conditions and employ new ones, that do. Here’s where ConductR comes in – as a modern way of managing, deploying and inspecting applications. First, what you have to do, is to define nodes which will be used to deploy services. If you are afraid it’s something difficult, don’t worry – I will show you an easy example to get started. Almost all operations are doable in one command. Once the nodes are ready, ConductR provides a cluster visualization containing the status information for each node as well as all deployed services (it depicts the location of each service). Specially-prepared scripts allow you to load or unload services onto nodes. 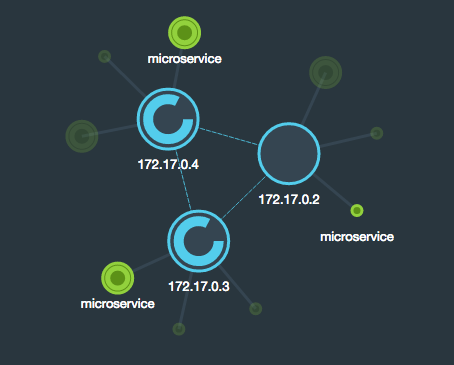 If you load your service, ConductR pulls it onto each node and prepares it to be ready to use. It also decides which nodes should be used to run the app. The only thing you need to do is choosing how many nodes you want to use for your service. If (because of any reason) one node crashes, all services which were running on that node are started on another one. HAProxyinstalled helps to switch traffic immediately. HAProxy works also as a load balancer – you can run service on multiple nodes and all traffic will be managed and targeted to the proper server. This way you get more resilience for free. The last thing worth mentioning at this point is service discovery. Service discovery manages how processes and services in a cluster can find and talk to each other. This way another pain point of microservices is solved. I will elaborate more about each of above points, but firstly I have to describe one important topic in the context of ConductR. Before I’ll go deeper into this topic, there are two terms that require some explanation: application and bundle. A bundle is a deployable piece of application which typically consists of only one component. The role and other metadata are placed in a configuration file (bundle.conf), which gives ConductR some basic knowledge about this bundle, in particular: the role of the bundle and what is required to load and run a component. Other attributes configured in this file are: bundle’s version, name of the components, system requirements and network endpoint mappings. You can run a bundle locally and in production without any changes. An application in the ConductR context is a collection of at least one bundle. The developer decides about shape of the application: what bundles should it run, how many instances of every node and what other services are needed. The core element of ConductR stack is a script which gives a possibility to manage the application’s state from command line. Because script is written in Python you have to have it installed in your OS. conduct (the script has such name) is helpful for developer and operation teams. Using the script you can build and package your bundles as application, deploy it onto nodes ready to run or add specific configuration parameters to your bundle. ConductR also has a small application on top of Play Framework, which is responsible for visualization of your stack. You can see loaded bundles, the active ones and status of the nodes. Sadly, you cannot take any actions here, but even without that, it’s very helpful. There’s one question I failed to answer so far: what kind of applications can be deployed by ConductR. Actually, at this point this tool is mostly targeted onto Scala ecosystem – you can use all Akka based applications almost out-of-the-box. If you have a service written in Java you should try to wrap it with Lagomfirst. Lagom and ConductR work perfectly together. Lagom allows you to split the monolith or create new services from scratch. While ConductR eases the pain of deployment and operations. This way you can add new powers to your old codebase. But how to make our application able to run over ConductR control and communicate with other bundles? You have to add sbt plugin as a dependency to your project and configure it. Actually, almost all configuration properties have default values, so with little of luck you won’t have to change anything. To show more advanced topics in ConductR, I’ve prepared small akka-http based services I’ll use in further example. You can find the source code at starting point here. Our goal is to make this service use ConductR, so it’s easy to run locally and deploy to production. You should see aforementioned text in the browser now. Now is time to prepare ConductR. Firstly, you should install Docker if you haven’t already done it. If you need any advice in this topic you should go to docker.com website. I won’t describe this process here. Docker is the default virtualization technology used by ConductR. If you wish you can also use something else, but it’s out of the scope for this short post. You should also install the proper version of Python – ConductR scripts are written with Python 3 and such version should be available in your system. I will skip this task. Go to Python’s website for more information if needed. After successful installation we should have two scripts available in our system: sandbox and conduct. Sandbox is a Docker wrapper. With this script you can run ConductR as a container and be able to setup ConductR cluster easily and quickly. 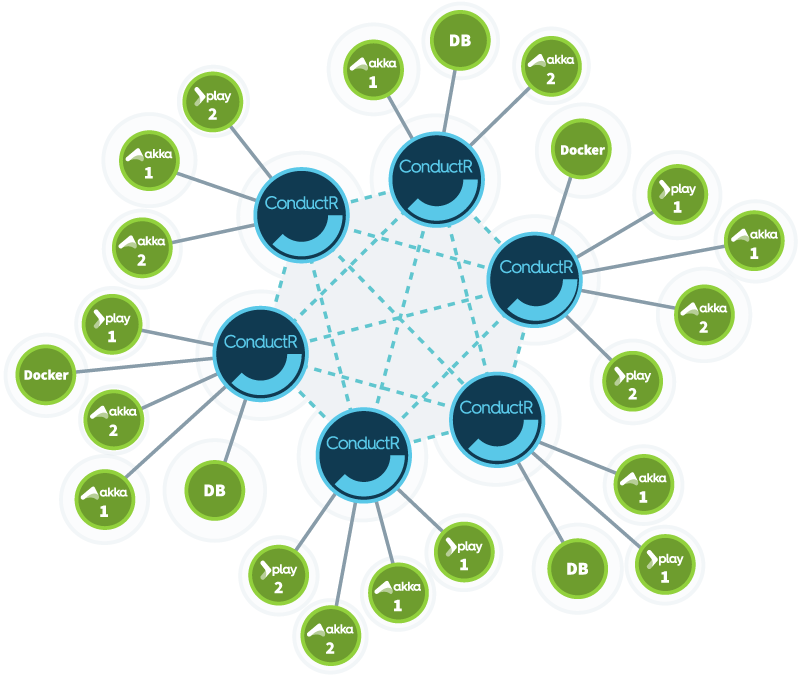 Conduct is responsible for managing applications and bundles which run on a ConductR cluster. 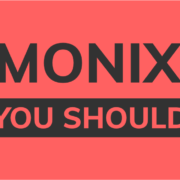 These commands will prepare a pre-configured Docker image needed by ConductR (HAProxy, etc.). When you are done, you can stop container with simple sandbox stop, but let’s keep it working for now. 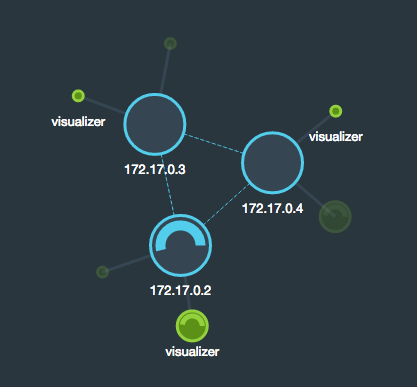 There are 3 active bundles in container, Visualizer and eslite. Eslite is elastic search bundle which is responsible for gathering logs from all nodes. We won’t cover this topic here, but if you want to know how logging works look into official documentation. Open the browser to check what the visualizer looks like: http://192.168.99.100:9999. You see there are 3 nodes labeled with their internal docker’s IP. Small circle means the bundle is loaded but not active, so you can see that every bundle is loaded on every node and ready to run. Slow running circle means node/bundle is running and fast running circle – it’s loading/activating. From command line you can use conductr info to check how many copies of bundle are replicated or running. We need to make few small changes to our application before it can work with ConductR. We chose for our bundle 1 CPU, 64MB of memory, small amount of disk space. There is also information that bundle should expose http port 9000 for its internal service. This bundle is also assigned the backend role. Actually, in our simple example it changes nothing, but in your application you can define which roles are available for every node, so ConductR won’t run a service on a node unprepared for it. Lightbend prepared few small dependencies for common application types, that will perform all the heavy-lifting for you. Since we are using Akka 2.4 we will use akka24-conductr-bundle-lib. Newer versions, like Play 2.5, will work out-of-the-box without the need for new dependencies. microservice is the name of my app so I created section for these, but you can choose name for this block for your own. The most important part is inside this block. I’ve defined each property twice. If you’re familiar with Typesafe Config you probably know what is going on here. Config’s engine loads first property, but after that is trying to look for environment variable with name MICROSERVICE_BIND_IP (for host). First value will be replaced when the variable is set. Where do this env variables come from? They are provided by ConductR. We can load properties which start from uppercased name of our app (like in example above), or defined per BUNDLE or even more general. You can find the entire list of variables here In this way, our application will choose port 8080 when will be run locally. There are yet two changes we have to do in server code. next, call the function which informs ConductR when the application would boot up. Remember to call the function when your service is ready to work, so after initialization, connecting with external services and so on. Yep, our service is running. Open the browser and point to http://192.168.99.100:9000 to ensure of that. Actually, you should also see the app on ports 9010 and 9020 in your browser, because these are pointed to other nodes, but conductR provides a load balancer and knows where the bundle is and how to route traffic there. And here you go: your service runs on two load balanced nodes. I hope you will find this short introduction to ConductR helpful. Best Regards. I’m an experienced developer who has acquired a broad knowledge. I’m always ready for new challenges and learning new skills.